All of us encounter automation in nearly all the aspects of our lives… usually in various forms of embedded computing devices ranging from sensors in facilities such as the buildings where we work or live, powerplants that generate the energy we consume, municipal drinking water and wastewater management systems, to smart vehicles and smart devices that surround us, and even to household items and clothing. All of these “things” allow the equipment they are connected with to be sensed or controlled remotely, in a streaming fashion, using the existing network – the Internet. The Internet of things (IoT) is relatively recent term. Predictions for the growth of IoT vary considerably. Since there are much more “things” than people, the scale of these changes is expected to be larger than the expansion of the internet over the last two decades when a large part of world’s population got connected to the internet. As consumers, we have already begun to experience IoT benefits, but what is the IoT presence in the curriculum at the colleges and universities? What is the student’s experience with it? Are we preparing up-and-coming generations to be able to grow and maintain IoT expansion? There are several online courses available from prominent universities such as King’s College, Princeton, and more that are addressing the topic of IoT, communications and multimedia. Here we would like to share our FacilityConneX experience and the lessons learned from introducing the topic of Industrial IoT (IIoT) to a graduate level computer science course (in the classroom and online) at Boston University (BU). The course has been taught for several years by FacilityConneX’ chief data scientist Zlatko Vasilkoski. The focus of this addition to the curriculum was related to designing a forecasting model used to optimize the energy consumption of an office building. The course was composed of a series of lectures on the topic and to enrich the learning experience it was accompanied by a hands-on laboratory/assignment component. For easier adoption, a list of reference materials used in the course were provided and included standard textbooks on the topic. Additional tools included resources from FacilityConneX, such as documentation and access to their cloud-based monitoring and analytics platform, and some reference materials from FacilityConneX’ partners such as B2Q Associates. Nearly every building, plant or powerplant today is designed with energy efﬁciency in mind. They need to stay optimized throughout the duration of their lifetime. For example, the oldest buildings at BU are over 150 years old. 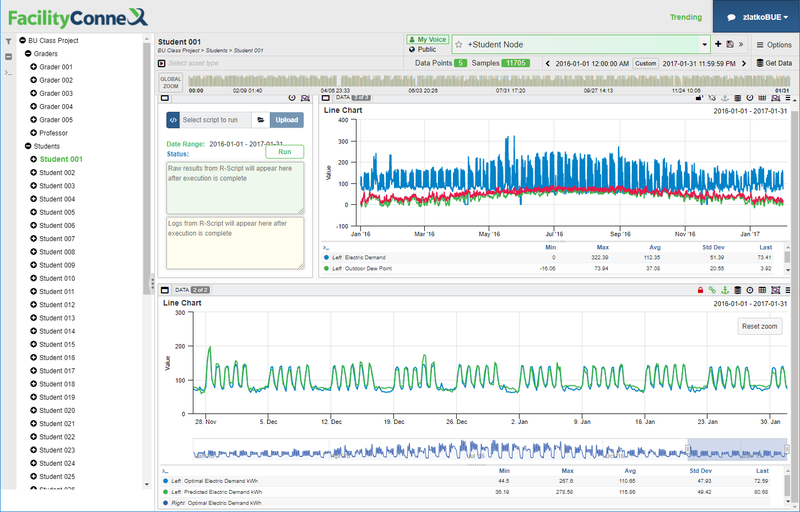 It becomes apparent that system degradation and facilities operations declining from peak efﬁciency is a constant challenge, requiring the need for continuous optimization assisted by streaming analytic computations. One of the biggest challenges of effective facilities and energy management is to accurately determine optimal energy use and the cost associated with it. For this purpose, an energy baseline is used as a convenient reference tool. This is accomplished by creating a data model of the site’s energy consumption, typically using regression analysis techniques. The course material started with baseline illustrations of the regression techniques on simpler examples, and progressively moved to more realistic situations requiring more complicated techniques. Data existing within the FacilityConneX cloud platform was used to demonstrate this to the students. For more realistic and practical energy usage baselining, a recurrent neural network (RNN) was used in this class to create a forecasting model. The use of this RNN was illustrated on a simple example. The students were expected to expand the RNN forecasting model using several years of data for a real office building. The task required programming skills to correctly manage the pre-processing and cleaning of the data, as well as data science skills to arrange and modify the training data to account for realistic artefacts such as floating holidays. Namely, if the RNN was trained on data from a previous year, the occupancy, which is one of the key features related to energy consumption, of an office building will be captured for fixed holidays, but not for floating holidays. For example, Dr. Martin Luther King Day is observed on the third Monday of January each year. If not treated properly during training the RNN, the floating holidays will introduce erroneous forecast for the following year. For their assignment, students were supposed to train and optimize their RNN forecasting analytics locally on their computers, and once satisfied with the fit of their model, they deployed their ﬁrst IIoT analytics on the FacilityConneX cloud. Each student was provided with login name and the upload of the student’s analytics was accomplished by logging in to the FacilityConneX User Interface. Once logged in, the FacilityConneX UI provided the capabilities to select the local script, then upload it and run it on the FacilityConneX cloud. When the run was ﬁnished, student’s forecasted results were charted in the FCX UI (overlaid over the optimal electric demand), displayed in JSON format in the UI text box, and could be downloaded by the student or the graders. The optimal electric demand is available only on the cloud and not available to the students locally. All this is illustrated in the image below. The view in the image above is the professor’s view, which can oversee every student’s and teaching assistant’s work. Each of the five teaching assistants could see only their students work in their personal user group only. And finally, each student could see only his or her work. The top charts in the image above illustrate the seasonal, daily and hourly changes of the input office data used for forecasting. The bottom chart in the image above shows “Student 001” forecasted electric demand (green) compared to the optimal electric demand (blue). Over the last few years, before including the IIoT topic to the curriculum, I have noticed an increasing trend of familiarity with IoT among my students, but still this familiarity never exceeded a quarter of them. This dramatically changed after the IIoT topic was added to the course during the fall semester of 2017. Based on my own evaluations and feedback from the 84 students, the added IIoT topic was very well received. Here at FacilityConneX, we would like to think that by providing the ﬁrst hands-on IIoT experience to the BU students in this class, we are making a contribution to the IoT presence in the curriculum at the colleges and universities, and thus preparing them for a world where expansion of IoT in all facets of life will continue to grow. 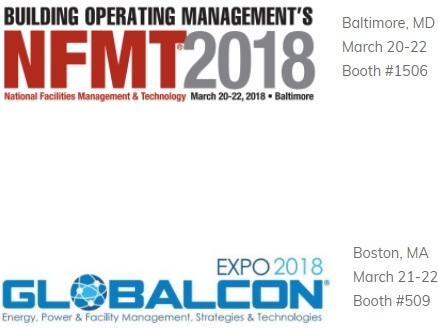 Join FacilityConneX at the following shows in March and Follow FacilityConneX on LinkedIn!